Swallowtail Jewellery: It's time for a cup of Spring Bead Soup! 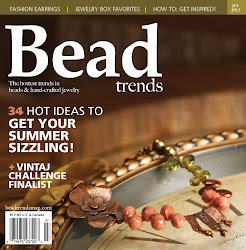 It's time for a cup of Spring Bead Soup! It's reveal day!! 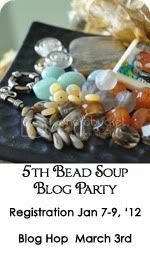 I am so happy to be participating in another Bead Soup Blog Hop. Thank you so much to our very talented, kind and generous host Lori Anderson for organizing this wonderful event. Please take a moment to hop on over to her blog and check it out. She is an awesome lady!! Thank you Lori!! Thanks also to my wonderful bead soup partner Kiersten Kern! Kiersten sent me beautiful beads to play with. Be sure to visit Kiersten's blog and see what she made with the stash I sent her. Click on Kiersten's name and it will take you to her blog. Here's a reminder of the bead soup I received from Kiersten. Hmmm! What do with the clasp. I must admit to being a little stumped on this one! I have never worked with a clasp like this before so it was a good challenge. I originally thought I could make a bracelet but I wasn't happy with the look of it when I had strung the beads and put it together. I put the clasp aside for a while and concentrated on the focal bead. This bead is stunning! Love it! 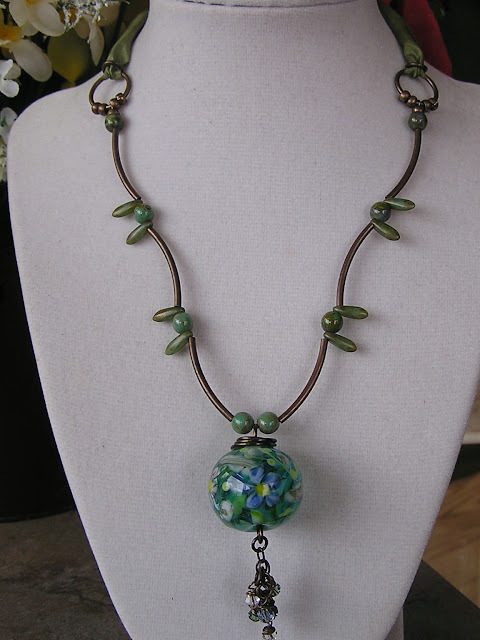 I made the "Spring Flowers" necklace below - trying to keep it simple so that all the attention is on the stunning focal bead. I used brass tube beads, Czech glass beads, Swarkies and green ribbon. ﻿I made some earrings with the beautiful blue lampwork beads. "Morning Mist" Earrings - I added some delicate brass chain and brass dragonfly charms. The scrummy faceted blue sandstone beads went well with some coca seed beads and citrine beads that I found in one of my beadie boxes. The little brass charm has "believe" stamped on it. The blue Czech glass flower charm is topped with brass bead caps. "Believe in Dreams" Bracelet. Here is how I used the gorgeous sterling silver clasp. It took me a few attempts but I got there in the end Lol! I used three of the beautiful lampwork beads Kiersten sent me and paired them with some pale blue glass crystal beads. I used silver crimp beads as spacers and hammered some 18 gauge wire to form the paddle drops. Again, thank you so much to Lori Anderson for all her hard work and organization of this huge event. Thank you also to my lovely bead soup partner Kiersten for sending me such beautiful beads to work with. I had great fun working on these designs. I can't wait to see what Kiersten made with the soup I sent her! For a list of all the participants in this 2nd Reveal go to this link and start hopping! 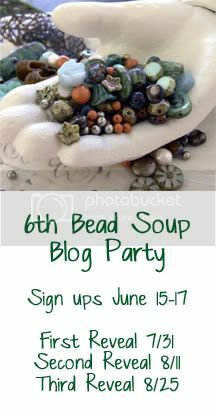 http://lorianderson-beadsoupblogparty.blogspot.com/2013/04/7th-bead-soup-blog-party-2nd-reveal.html. So much jewelry...so little time. LOVE,LOVE, LOVE your first necklace. Elegant! Be sure to visit my blog for this reveals favorites. Karen, your pieces are stunning. I absolutely love the last necklace, the clasp is beautifully showcased! Really nice. What fun it has been to be paired with you. Nice soup Karen! I'm in the mood for spring too ;0) I like the extraordinary style of your first necklace! 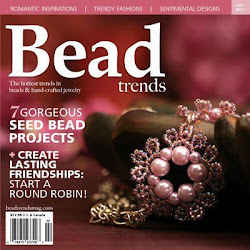 I can always tell when a designer is passionate about their bead soup, like you are about yours. The amount of time, effort and thought that went into each piece is quite clearly shown ant the result is a beautiful mix of wonderful jewellery pieces. I can't really pick a favourite, they're all so gorgeous. Both necklaces take my breath away, lovely! I really like your Spring Flowers necklace. That is my favorite, but all of your designs a beautiful. Your designs are Gorgeous ! Each component stands out so perfectly . Your spring flowers necklace is stunning in it's simplicity! WOW! I love all your pieces...you worked with many different styles and there has to be a piece up there to suit every taste! Beautiful!! All your pieces are gorgeous, but I love the necklace you created with the focal --just beautiful! Beautiful pieces, I would wear any of them! 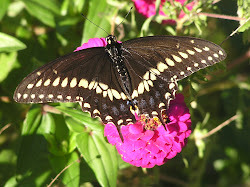 and I love the name of your blog~ Swallowtail's are my favorite butterfly! All the pieces are great but I especially love the spring flowers necklace. You have so many lovely pieces. I have to admit I probably would have hoarded the lampwork all in to one piece, but you did perfectly making so many beautiful pieces with that amazing lampwork set. I think I love the stormy day earrings best. The clasp would of stumped me too Karen but you pulled it of. Great design. very elegant projects!last earrings are my fav,congrats! Great pieces, my preference goes to both earrings as they are so original! Your Lotus Flower necklace is perfection. I was especially drawn to those blue sandstone beads and they really shine in the bracelet you created with them. What are the brown wavy beads in that design? Intriguing! I love the simplicity of the Spring Flowers necklace. You did such a great job highlighting the focal. Each of your pieces are so striking and elegant! Love how you ended up using the clasp in the last necklace! Excellent work! I love all of your pieces.. Awesome job. The first necklace is so unique and beautiful. Your solution for the clasp is refreshing and unexpected. I love all your works, beautiful designs. I'm on the 3rd reveal, what fun BSBP! Thank you for visiting me and the nice comment. You have made some lovly things, I really like your necklaces they are both very different, great use of your soup. all are very beautiful designs! Your pieces are so balanced and beautiful. Lovely work. Thanks for visiting my blog as well. Beautiful pieces! Good ide for using the claps! Beautiful. Love the brass spacers in first necklace. You really let that focal shine. Love the dragonfly earrings and that last necklace is gorgeous. Great job on everything. I love all your pieces, but the use of the clasp is really great! Great work! Love everything you made! Usage of the tube brass was so clever and added such a unique design to the first necklace. Love the stormy day earrings too! Great job! You really got so much made with your soup ingredients! That first necklace is stunning and really draws your eye to the focal while still being a beautiful design in its own respect. All of your other pieces are quite lovely as well. 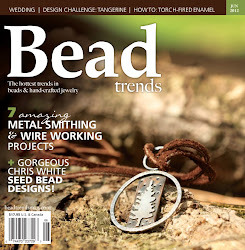 The curved beads on the Spring necklace remind me of vines and work perfectly with that focal. Lotus Flower Choker Style Necklace is my favorite!! they are all so nice...i love the lotus necklace. Your Spring necklace really does let the beauty of the lampwork focal take center stage. Nice job! Beautiful job, Karen! The first two lampwork pieces - the Spring Necklace and Morning Mist earrings - are my favorites! I love the way you finished the necklace with the ribbon in back. You did wonderful work with all of the lampwork! Wonderful job with your soup. I especially like the spring necklace..very very pretty! 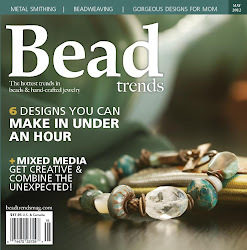 You created a beautiful collection with your bead soup! I love both the first and last necklaces; each has a beautifully unique style. Gorgeous work, love all your pieces. The first necklace is such a lovely and delicate framing for the beautiful focal. And the necklace you used the focal in is just wonderful! It may have taken you a while to figure out how to use that clasp, but the result is really a treat! Karen you used your soup well. All of your pieces are beautiful. Spring Flowers Necklace is my favorite. Oh my goodness. All of your designs are just gorgeous. I am especially in love with your Spring Flowers. I just love the lines that the curved tube beads give it. What a lot of gorgeous pieces you made, i love the 'Morning Mist earrings. Such beautiful pieces and I love the colors you had to work with. Swallow tail my fav. We are Karen and Emma - a mother and daughter partnership. In 1996 we came to the USA from a sleepy cotswold village in England. It took us a while to adjust but we are very happy to be living and working in Iowa. We hope you enjoy our blog and we look forward to getting to know you. 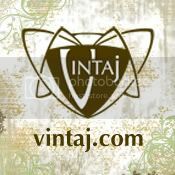 Thank you for your interest and for visiting our blog.